I wasn't expecting to be back so soon, but wanted to show this cute little pincushion that I finally got around to finishing recently. If you've been a regular follower to my blog in the past you may remember me mentioning how much I love pincushions and that they are one of my favourite finishes. So about a year ago when I came across the tutorial for this cute little pincushion in a bowl I just had to make one to add to my collection of pincushions. I was so excited when I spotted it because I recognised the little bowl straight away as I had already bought several from Crate and Barrel here in Dubai. Until recently I didn't have all the supplies I needed to finish and attach the metal label, but here it is at last - my first attempt! It's so sweet, I love it, and will definitely be making more! Hi Carol, Your Pincushion looks quite lovely. So nice to see new blog posts from you. Very sweet and so useful and sturdy. How sweet this is! Pretty work, as usual. Adorable Carol! And your holiday celebrations from last post look like a wonderful time with family. Love the pictures of Dubai and Oman too...so lovely and relaxing. That is so pretty Carol. That's it...I must make one for my pincushion collection too....thank you for sharing. 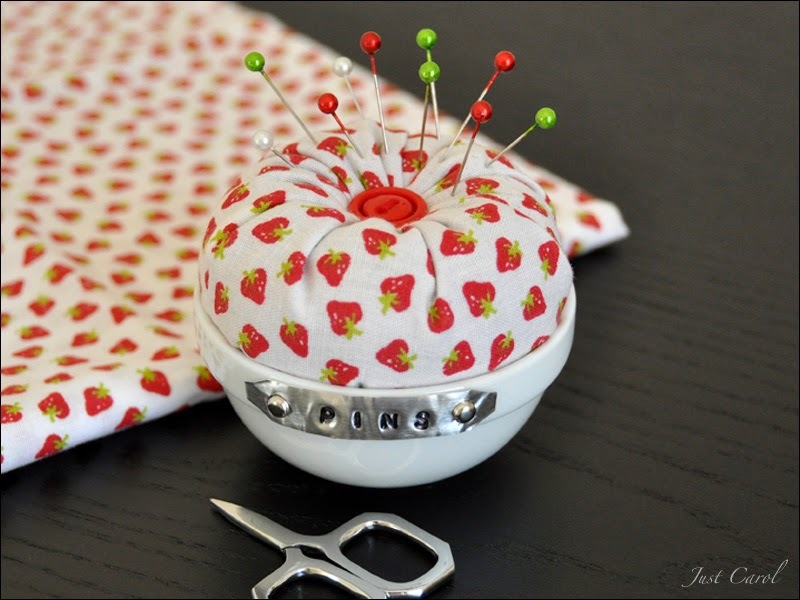 What a lovely pincushion, thanks fo sharing the site where the tutorial is. The strawberry fabric is perfect! Nice job, Carol.